WebAssembly is a very cool topic nowadays. WebAssembly is a new low-level binary format for the web. 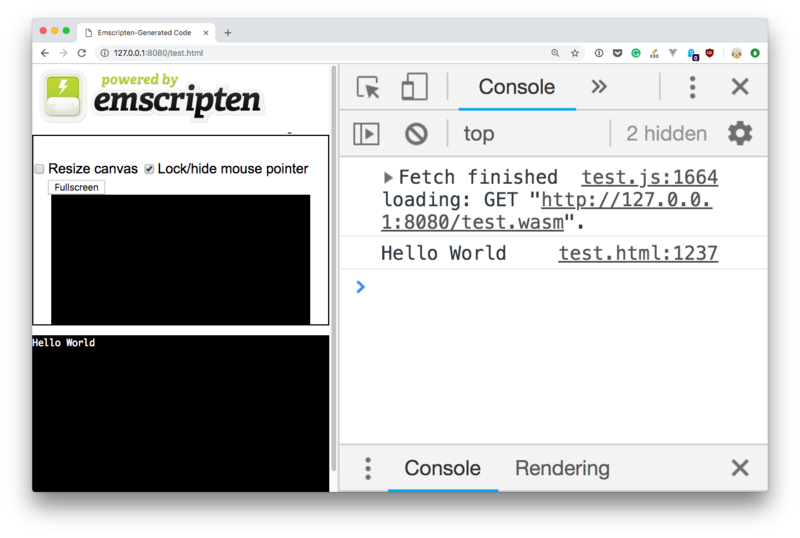 It’s not a programming language you are going to write, but instead other higher level languages (at the moment C, Rust and C++) are going to be compiled to WebAssembly to have the opportunity to run in the browser. It’s designed to be fast, memory-safe, and open. You’ll never write code in WebAssembly (also called WASM) but instead WebAssembly is the low level format to which other languages are compiled to. WebAssembly is a standard developed by the W3C WebAssembly Working Group. Today all modern browsers (Chrome, Firefox, Safari, Edge, mobile browsers) and Node.js support it. If you are interested in the subject I recommend to read Memory in WebAssembly and the Security docs of webassembly.org. WebAssembly was designed for speed. Its main goal is to be really, really fast. It’s a compiled language, which means programs are going to be transformed to binaries before being executed. It can reach performance that can closely match natively compiled languages like C.
Who is using WebAssembly today? Is WebAssembly ready for use? Yes! Many companies are already using it to make their products better on the Web. A great example you probably already used is Figma, a design application which I also use to create some of the graphics I use in the day-to-day work. This application runs inside the browser, and it’s really fast. The app is built using React, but the main part of the app, the graphics editor, is a C++ application compiled to WebAssembly, rendered in a Canvas using WebGL. The Web is not a limiting technology any more for those products that require a very performant piece to their core. How can you use WebAssembly? 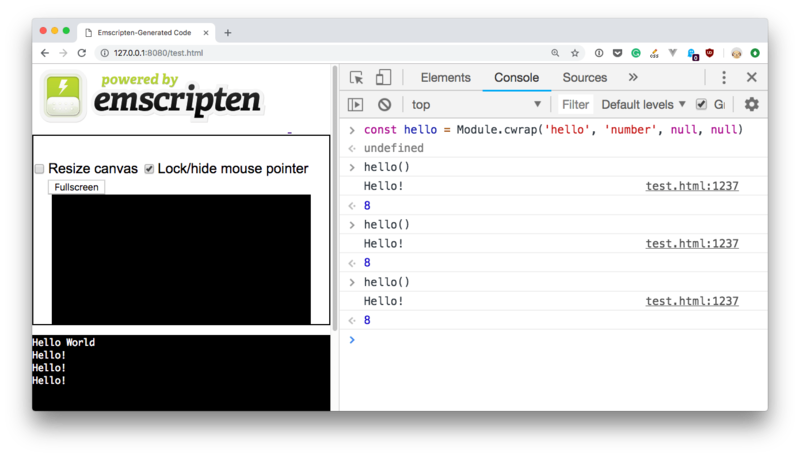 Emscripten will do a lot of work for you, like converting OpenGL calls to WebGL, will provide bindings for the DOM API and other browsers and device APIs, will provide filesystem utilities that you can use inside the browser, and much more. By default those things are not accessible in WebAssembly directly, so it’s a great help. Rust code is different, as it can be directly compiled to WebAssembly as its output target, and there’s an https://developer.mozilla.org/en-US/docs/WebAssembly/Rust_to_wasm. What’s coming for WebAssembly in the future? How is it evolving? WebAssembly is now at version 1.0. It currently officially supports only 3 languages (C, Rust, C++) but many more are coming. Go, Java and C# cannot currently be (officially) compiled to WebAssembly because there is no support for garbage collection yet. Now, make sure you have an up to date version of Python installed. I had 2.7.10 and this caused a TLS error. I had to download the new one (2.7.15) from https://www.python.org/getit/ install it and then run the Install Certificates.command program that comes with the installation. I am going to create a simple C program and I want it to execute inside the browser. and running ./test would print “Hello World” to the console. As you can see, the program ran and printed “Hello World” in the console. Let’s tweak the Hello World defined previously. EMSCRIPTEN_KEEPALIVE is needed to preserve the function from being automatically stripped if not called from main() or other code executed at startup (as the compiler would otherwise optimize the resulting compiled code and remove unused functions - but we’re going to call this dynamically from JS, and the compiler does now know this). This little function prints Hello! and returns the number 8.
emcc test.c -s WASM=1 -o test.html -s "EXTRA_EXPORTED_RUNTIME_METHODS=['ccall', 'cwrap']"
The 4 parameters that Module.ccall takes are the C function name, the return type, the types of the arguments (an array), and the arguments (also an array). The types we can use are null, string, number, array, boolean. Here’s the official docs for ccall and cwrap.